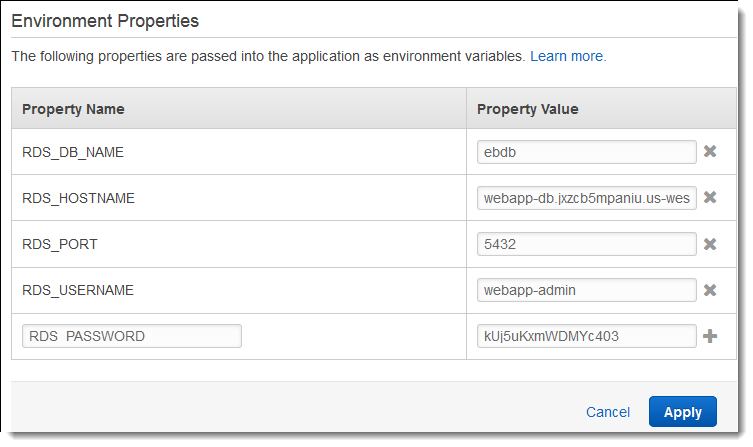 This tutorial describes how you launch an Amazon RDS DB instance that is external to AWS Elastic Beanstalk. Then it describes how to configure a high-availability environment running a WordPress website to connect to it. The website uses Amazon Elastic File System (Amazon EFS) as shared storage for uploaded files. Running a DB instance external to Elastic Beanstalk decouples the database from the lifecycle of your environment. This lets you connect to the same database from multiple environments, swap out one database for another, or perform a blue/green deployment without affecting your database. The sample application uses Amazon EFS. It only works in AWS Regions that support Amazon EFS. To learn about supporting AWS Regions, see AWS Regions and Endpoints in the Amazon Web Services General Reference. This tutorial was developed with WordPress version 4.9.5 and PHP 7.0. Creating a DB instance takes about 10 minutes. In the meantime, download WordPress and create your Elastic Beanstalk environment. To prepare to deploy WordPress using AWS Elastic Beanstalk, you must copy the WordPress files to your computer and provide some configuration information. Extract WordPress and change the name of the folder. Extract the configuration files over the WordPress installation. Use the AWS Management Console to create an Elastic Beanstalk environment. Choose the PHP platform and accept the default settings and sample code. After you launch the environment, you can configure the environment to connect to the database, then deploy the WordPress code to the environment. Verify that the structure of your wordpress-beanstalk folder is correct, as shown. The customized wp-config.php file from the project repo uses the environment variables that you defined in the previous step to configure the database connection. The .ebextensions folder contains configuration files that create additional resources within your Elastic Beanstalk environment. The configuration files require modification to work with your account. Replace the placeholder values in the files with the appropriate IDs and create a source bundle. To update configuration files and create a source bundle. Modify the configuration files as follows. .ebextensions/dev.config – restricts access to your environment to your IP address to protect it during the WordPress installation process. Replace the placeholder IP address near the top of the file with the public IP address of the computer you'll use to access your environment's web site to complete your WordPress installation. Depending on your network topology, you might need to use an IP address block. .ebextensions/efs-create.config – creates an EFS file system and mount points in each Availability Zone / subnet in your VPC. Identify your default VPC and subnet IDs in the Amazon VPC console. Create a source bundle containing the files in your project folder. The following command creates a source bundle named wordpress-beanstalk.zip. Upload the source bundle to Elastic Beanstalk to deploy WordPress to your environment. Choose the environment URL to open your site in a browser. You are redirected to a WordPress installation wizard because you haven't configured the site yet. Perform a standard installation. The wp-config.php file is already present in the source code and configured to read the database connection information from the environment. You shouldn't be prompted to configure the connection. Installation takes about a minute to complete. The WordPress configuration file wp-config.php also reads values for keys and salts from environment properties. Currently, these properties are all set to test by the wordpress.config file in the .ebextensions folder. The hash salt can be any value that meets environment property requirements, but you should not store it in source control. Use the Elastic Beanstalk console to set these properties directly on the environment. On the navigation pane, choose Configuration. AUTH_KEY – The value chosen for AUTH_KEY. SECURE_AUTH_KEY – The value chosen for SECURE_AUTH_KEY. LOGGED_IN_KEY – The value chosen for LOGGED_IN_KEY. NONCE_KEY – The value chosen for NONCE_KEY. AUTH_SALT – The value chosen for AUTH_SALT. SECURE_AUTH_SALT – The value chosen for SECURE_AUTH_SALT. LOGGED_IN_SALT – The value chosen for LOGGED_IN_SALT. NONCE_SALT — The value chosen for NONCE_SALT. Setting the properties on the environment directly overrides the values in wordpress.config. The sample project includes a configuration file (loadbalancer-sg.config) that creates a security group and assigns it to the environment's load balancer, using the IP address that you configured in dev.config to restrict HTTP access on port 80 to connections from your network. Otherwise, an outside party could potentially connect to your site before you have installed WordPress and configured your admin account. Now that you've installed WordPress, remove the configuration file to open the site to the world. Delete the .ebextensions/loadbalancer-sg.config file from your project directory. Finally, configure your environment's Auto Scaling group with a higher minimum instance count. Run at least two instances at all times to prevent the web servers in your environment from being a single point of failure. This also allows you to deploy changes without taking your site out of service. To support content uploads across multiple instances, the sample project uses Amazon Elastic File System to create a shared file system. Create a post on the site and upload content to store it on the shared file system. View the post and refresh the page multiple times to hit both instances and verify that the shared file system is working. To upgrade to a new version of WordPress, back up your site and deploy it to a new environment. Do not use the update functionality within WordPress or update your source files to use a new version. Both of these actions can result in your post URLs returning 404 errors even though they are still in the database and file system. Export your posts to an XML file with the export tool in the WordPress admin console. Deploy and install the new version of WordPress to Elastic Beanstalk with the same steps that you used to install the previous version. To avoid downtime, you can create a new environment with the new version. On the new version, install the WordPress importer tool in the admin console and use it to import the XML file containing your posts. If the posts were created by the admin user on the old version, assign them to the admin user on the new site instead of trying to import the admin user. If you deployed the new version to a separate environment, do a CNAME swap to redirect users from the old site to the new site. The sample application uses configuration files to configure PHP settings and create a table in the database, if it doesn't already exist. You can also use a configuration file to configure your instances' security group settings during environment creation to avoid time-consuming configuration updates. See Advanced Environment Customization with Configuration Files (.ebextensions) for more information.